On each photo there is a faint horizontal line going across the top. This is the approximate location of the stringing hole or in some cases there is a sterling plated bail. Each one of these are a perfect work of art using Mother Natures pigments as decoration!! The pricing on these beauties are below wholesale.. A perfect opportunity to grab some Xmas gifts quick..Each is one of a kind ..only one of each available. All I have is listed this week. Each comes in a beautiful organza gift bag. CLICK HERE OR ON THE GRAPHIC TO ENTER THE PENDANT SALE!!!! 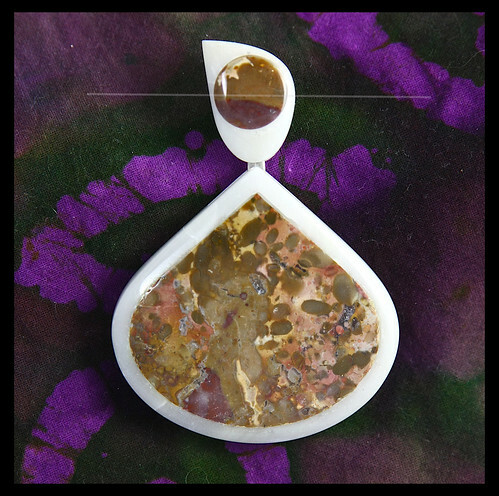 I grabbed one of the pendants… I love stone. Just went to a bead show and the fused bead artists couldn’t hold a candle to your wonderful artwork! I will have to get over htere and take a look before they are all gone! Still can’t wait for the trunk show….to see what you are going to surprise us with!